Current Production Time & Shipping Info »»» production time is 7-10 business days. Choose your shipping preference at checkout. 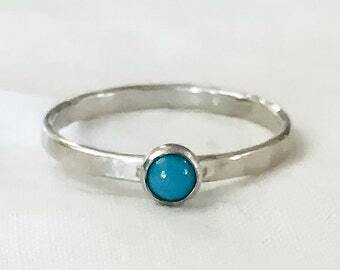 Custom jewelry requests are always welcome, just send me a note! 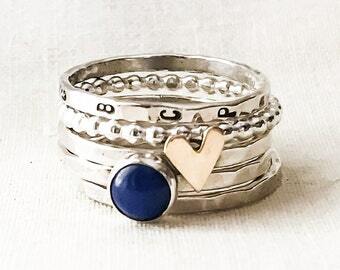 Customize two rings to create a lasting memory and keep the little things close to your heart. 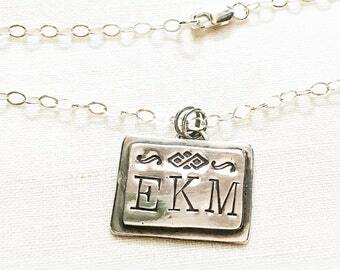 Three new monogram necklace styles ready for holiday giving. Taking orders thru December 20th domestic shipping. Happy holidays! Joy, Love, Peace, or celebrate your family. Wear your mantra as a daily reminder of the little things. Perfect for giving. Be real. Adorn Yourself. Just be. There hasn’t been a time in my life that I didn’t have paint or pen on my hands, a sketchbook just within reach, or creative inspiration flooding my thoughts. I always knew I needed to be a working artist, and in college I signed up for a beginning metals class. Although I only took that one course- I fell fast and hard in love with all things metalsmithing. I am inspired by the challenge of metal, the sparkle of a beautiful stone, and the timelessness of creating a wearable sculpture that can last a life time. My love for contour and texture and collage can be found in my work as I love to combine interesting hand cut shapes, different metals, and hand stamped textures. With my passion for making jewelry comes an impossible thirst to learn more every day about the trade. I love challenging myself to learn new techniques; each new skill a drop in the vast and probably endless sea of this amazing craft. I feel so blessed to have the most wonderful customers, and to be able to be who I want to be and do what I love. As a small business owner, I enjoy the opportunity to make socially and environmentally conscious decisions. ♥ The success of Tarnished & True has inspired me to become a child sponsor for a little girl in Africa since 2012. It always feels good to give back. ♥ The majority of my packaging is eco-friendly, from my 100% recycled business cards and Kraft boxes, to the soy based inks my stickers are printed with. I am working towards having all of my packaging be the best it can be for our environment. I believe in good food, sunshine, happy children, and a lot of love. A day with my family exploring the natural world around us makes my heart full. Welcome to Tarnished & True. I am inspired to create beautiful jewelry with a hand crafted, artisan look. I only use quality materials, including gemstones, copper, brass, solid sterling silver and solid gold. Everything you see here is made just by me, just for you. Be Real. Adorn Yourself. Just be. I love what I do, and it is my highest priority that you love what I do, so please understand that I will do my best to make your purchase a wonderful experience! In the event that you are dissatisfied with your purchase, I will refund the purchase price or issue a store credit - minus shipping fees. You must contact me within 5 days of receipt and return the item within 5 days of our agreement of the return. The item must be in original condition and returned before refund or issuance of a store credit. Any returns must be shipped with delivery confirmation and tracking number. This protects you in case the item is lost in the mail. Personalized and custom made to order items are non-refundable since they cannot be resold. If you have a size issue, please contact me. I realize that ordering a ring (especially for someone else) can be difficult when it comes to sizing. 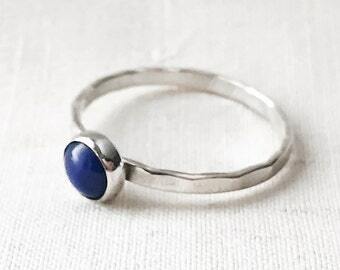 Some of my rings can be easily resized and some cannot be resized at all. A resizing fee may apply depending on individual circumstance. I require a deposit for some special orders which is usually non-refundable and generally 50% of the purchase price. I do this to cover Etsy, Paypal, and material fees that I incur. Once a special order is made, it is nonrefundable. Your payment through PayPal or Direct Checkout through Etsy is much appreciated. You do not need a paypal account to pay with paypal using a credit card. Your order will be processed as soon as payment is received and you will receive notice as soon as it ships. I am happy to work with you using a layaway payment plan that works for you! Deposits are non-refundable and non-transferable. Layaway sales are final. Your jewelry is made by me by hand! That makes it super special, and also means it takes a little time. I make jewelry in the order each request is received, so there can be a wait because of that as well. If you have a time constraint, please contact me before purchase to arrange for expedition. I know how excited you are to get your jewelry and I am so excited to make it for you, so know I will do my best to get it to you as soon as I possibly can! I usually ship within 5-7 business days, but please check my shop announcement for current estimated production times. Items shipped within the United States are shipped USPS 1st class domestic with delivery confirmation and tracking which takes 3-5 business days, usually. Items over $200 are shipped with insurance. I cannot be responsible for items once they have been shipped. If you would like your package insured and it is less than $200, please let me know and I can make that happen for an extra fee. International orders are shipped via First Class International mail which takes 6-10 business days minimum, or much longer depending on the destination. It is your responsibility to know your customs regulations and pay any fees that apply. I cannot be responsible for any additional fees. Australia, Belgium, Brazil, Canada, Croatia, Denmark, France, Germany, Great Britain and Northern Ireland, Israel, Netherlands, New Zealand, Spain, and Switzerland. Once a package is shipped overseas, I have no way of tracking it, no way to know how long it may take to arrive, and I cannot be responsible for items once they have been shipped. If you would like your package sent priority with international tracking available, please let me know and I can make that happen for an extra fee. Items will arrive in my sweet environmentally conscious packaging...A hand stamped 100% recycled eco kraft box and eco-friendly aspen wood shavings. My bubble mailers are also made with 100% recycled paper, and my stickers are printed with soy based inks. On orders where multiple items are purchased, I pack the items together in one box unless otherwise requested. If you are ordering multiple items for gifting to multiple people, just let me know and I can wrap things up individually. I can also add a little note to your gift as well, just let me know! For bracelet and necklace measurement, tie a string around your wrist or neck so that it is comfortable then cut the string and measure its length. I love working with copper and brass, they are beautiful metals! However, both metals can leave a greenish residue on the skin, especially if worn for a prolonged period of time. This is a natural reaction, and completely harmless, and washes off with soap and water.